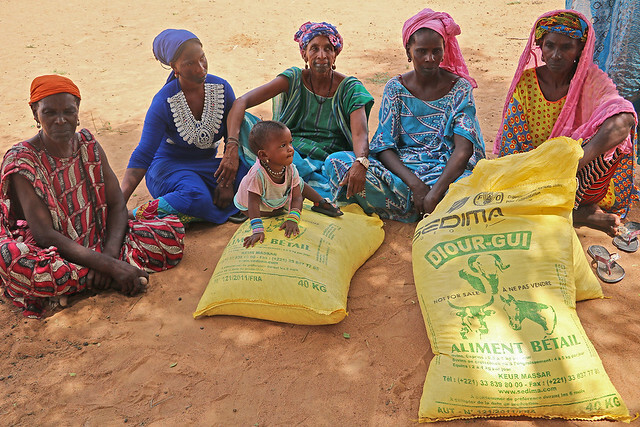 In the Louga region of in northern Senegal, pastoralists value FAO’s intervention that has provided 14 400 vulnerable pastoral households with a total of 1 540 tonnes of animal feed in response to the forage deficit in the Sahel. “A large part of my herd has been decimated. I don’t know the number of heads of cattle I have lost due to the poor rainy season that resulted in insufficient fodder to feed the cattle’’, said Mody Ba, a pastoralist in Keur Momar Sarr municipality, Louga. Farmers had to sell their sheep and goats to the market (XOF 9 000 per head) to cover their needs. Mody Ba recalls the difficult time he experienced in pastoral areas, as most pastoralists, due to an erratic rainy season in 2017. He’s very pleased to have been supported with animal feed (rock crabs) that allowed him to save a part of his herd, to increase milk production and to have enough money to buy food for his family. Mody has received three bags of feed of which he appreciates “the much better quality than other feed” he used to buy. “Since I received these bags, I stopped selling my animals to be able to afford feed”, he emphasizes. In the village of Gawdy, Aminata Sow lost ten sheep and many goats. Although she cannot assess the losses, she recalls the decline in the amount of milk produced by the animals. “Ever since we’ve received animal feed, there has been an increase in milk production. We are now able to collect 10 to 15 litres per week for sale in addition to the amount we consume, whereas before we barely produced 4 to 5 liters of milk”, she explained. The beneficiaries of the distributions were identified by a commission consisting of local authorities and FAO technicians, who selected livestock farmers (men and women) based on their level of vulnerability. In order to establish a revolving fund within the community, each beneficiary paid XOF 2 000 per bag received, allowing them to purchase animal feed at a lower cost the following year and to set up forage parcels. “This is very important for the empowerment of rural communities and to raise awareness on climatic vulnerability of pastoral activities in the Sahel. The activities promoted by FAO are a crucial step towards strengthening the resilience of pastoral and agropastoral livelihoods”, said FAO official Alberto Bigi. The animal feed distribution in Louga was implemented thanks to two FAO projects, funded by the Governments of Canada and Belgium, which aim to support pastoralists and the main activities included the treatment/deworming of livestock population in the regions of Saint-Louis, Matam and Louga. These two projects are part of FAO’s wider support to the emergency response plans established by the Sahelian countries, including the response plan of Senegal’s Ministry of Livestock, following the Food Crisis Prevention Network’s alert on the pastoral situation (March 2018). “FAO has developed a programme that has so far assisted almost 140 000 food-insecure agropastoral families (840 000 people) in six Sahelian countries – Burkina Faso, Chad, Mali, Mauritania, the Niger and Senegal – through emergency animal feed distribution, animal vaccinations, cash transfers, destocking, technical support in livestock and pasture management and the establishment of forage plots”, explains Coumba Sow, Coordinator of the Livestock subregional team for resilience in West Africa and the Sahel. As part of its three-year programme, FAO requires USD 166.8 million (2018-2021) to assist a total of 8.2 million people in the Sahel to restore livestock production – often the only source of livelihood for pastoralists – and to improve their food security and self-reliance.